Established in the year 2010, we, “PUSV Cashew Traders”, are the leading manufacturing, exporting, supplying and trading of Salted & Raw Cashew Nut. These products have been procured from the best manufacturers and has been produced using the latest manufacturing techniques and include Raw Cashew Material, Raw Cashew Nuts, Cashew Kernels, Raw Cashew etc. Most of our products find clients across the length and breadth of the country. 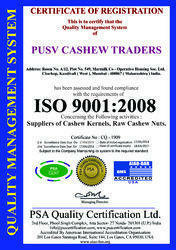 The cashew products supplied by us are characterized by hygienic packaging, and nutritious food value. We also ensure that our suppliers follow stringent quality control procedures to ensure consistently good product qualities. Today, we expanded to have a spacious warehousing facility and are able to meet the demands of our clients on a timely basis. Located at Mumbai (Maharashtra, India), we have are well known as one of the best suppliers of cashew products in the western part of the country. Over the years we have gained wide experience in the requirements of our customers. Moreover, after years of supplying to overseas customers, we are now in a position to offer suitable metallic products to clients across industries. We have a team of food technology staff who are experts in their respective domains. We also have a food testing laboratory where we carry out evaluation of the products of our suppliers before procuring them. The packaging of our products are carried out using the best packaging materials. We consider ourselves fortunate to be able guided by our mentor “Mr.Virendra Aeer [M.COM / G.D.C.& A./ I.C.W.A.& M.B.A.]”. He is an expert in food processing and has extensive industrial experience of several years. He can be credited to build our organization to the present scale. Moreover his ready accessibility has endured him greatly to our clients and many of them maintain personal relations with him. It is because of his sharp business acumen, attention to detail and sound technical knowledge that he has been successful in taking our company to such grand success. Pusv Cashew Traders is backed and supported by a infrastructure that is well-equipped with latest machinery that are required for carrying out in different processing operations. Our infrastructure is divided into manufacturing, in-house quality testing and warehousing and packaging units. In addition to this, we have established a huge sales & marketing units, to effectively manage and handle sales and marketing of the offered range at different markets of India. We have appointed a team of machine operators to handle different units of our infrastructure. Being a quality conscious name, we assure that the premium quality of the offered cashew nuts is never compromised. Total quality management at different stages of production has helped us in attaining the ISO 9001: 2008 certifications. We have established at in-house quality testing unit and appointed a team of quality controllers, to ensure that all the on-going processes are carried out in the most efficient manner. Our team of quality controllers holds expertise in their area of work, due to their profound experience in this domain. Since the inception of our company, we have followed total commitment in providing our customers with the best quality of cashew nuts and raw cashew at cost effective prices, customer satisfaction is attained by following complete transparency in all the business dealings. Respect & trust of our customers are attained by following fair trade practices with social responsibility. In addition to this, we assure timely delivery of the offered cashew nuts at the customers’ end. We have been able to cater to the precise needs and demands of our customers, utilizing the skills, knowledge and experience of our efficient manpower. We believe that our hard working professionals are driving force behind our remarkable position in this domain. To make them aware with the latest happening and development in this domain, we provide our professionals with regular training sessions through seminars and workshops conducted by the experts of this domain. Moreover, they work in close coordination with each other, to ensure a hassle-free workplace.